Invisalign Teen is designed specifically with the unique needs of busy teens in mind. Here's the information parents need to know. Why Choose Invisalign for My Teen? Invisalign is a convenient, comfortable and effective orthodontic treatment option that may just be ideal for your teen's busy lifestyle and unique needs. Invisalign clear aligners use the most advanced technology to uniquely design a treatment around your teen to reveal her best smile. Invisalign Teen was created with special features that are specifically geared to fit into teenagers' busy lives and meet their unique needs. In the hands of an experienced general dentist, Invisalign clear aligners can be used to treat simple to complex teeth straightening cases effectively and efficiently. With Invisalign, teens can continue to enjoy all their favorite things, from foods to sports, just like before treatment. Since Invisalign aligners are made of a smooth, lightweight plastic material, they are very safe and comfortable to wear. This means that neither of you have to worry about injuries from wires or brackets, or about unexpected trips to the dentist because of broken ones. The cost of Invisalign clear aligners are similar to braces. Plus, your orthodontic insurance may cover up to $3,500 of your treatment costs. During the early teen years, you child's smile is still growing. Invisalign Teen features special spaces in the aligners to give your teen's adult teeth room to grow. Invisalign Teen comes in a series of aligner sets, that must be change out every other week. Blue compliance indicator dots fade away to clear when the two weeks are up, making it easy for you and your teen to keep track of when it's time for the next set of aligners. Considering Invisalign for your teen? 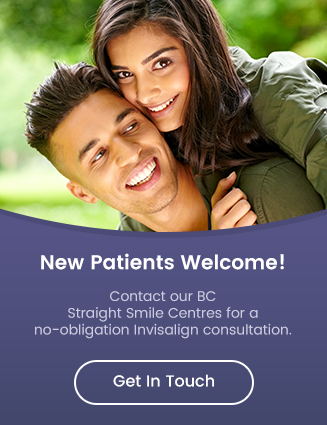 Contact us today to book a consultation with one of our friendly BC general dentists.